Summer arrived suddenly, and seemingly in a bad mood, at the end of last week. Such a relief! Washingtonians were able to stop complaining about rain and start complaining about heat. I spent Friday night putting away my winter clothes (which I was still wearing at the start of the month) and taking out my summer ones. Good news! I don’t like summer, but I like my summer clothes. This dress, however, was not among the things I took out of The Photographer’s closet (which is home to all of his clothes and my off-season ones). This dress is new. 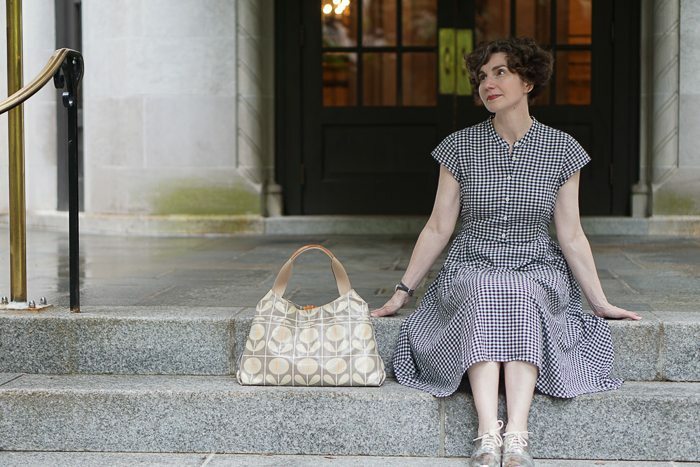 It’s perfect for summer: a very lightweight cotton lawn with an elasticized waist and full skirt. The fitted bodice with banded collar is very neat and tidy. 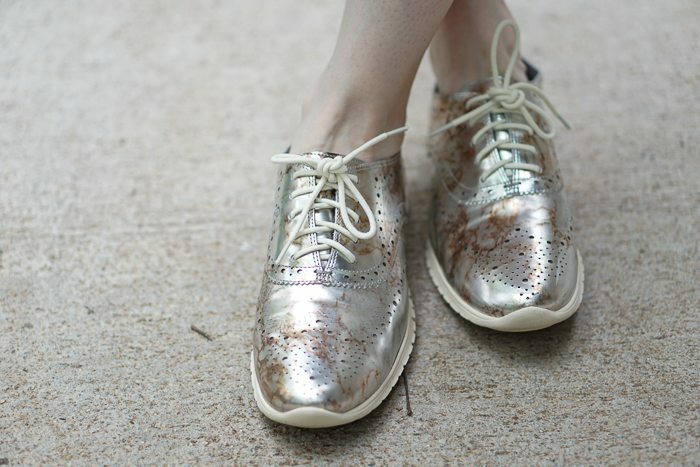 To keep the dress from looking too sweet (or twee), I wore it with these silver brogues. Cole Haan calls these “court shoes.” I don’t know what that means. They aren’t really suggesting I wear them for sport, are they? Above, I am carrying a striped tote bag, but I also like the look of this graphic floral bag, too. When pattern mixing, you almost cannot go wrong by mixing stripes, checks, and florals in any combination. O.K. Perhaps you could go wrong by mixing more than three different patterns in one outfit. Beyond that, the only limit on this rule is that you must vary the scale of the pattern if you combine two or more fabrics of one type —i.e., if you combine two florals, one should be large and one should be small. 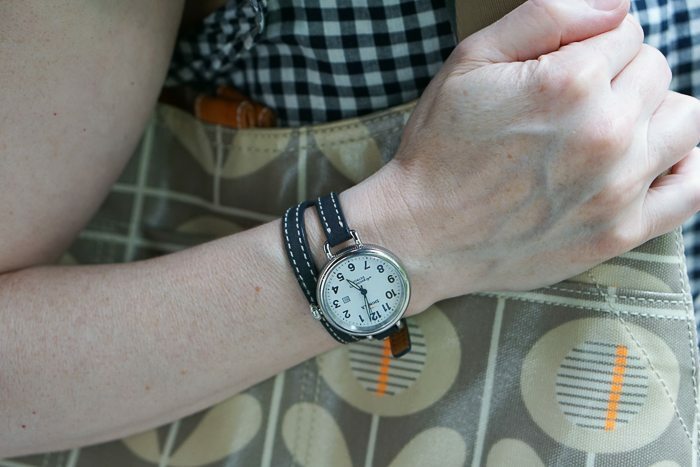 Rounding things out is a casual watch with a double-wrap band. The best thing about a dress like this is that you can sit comfortably anywhere. In the last photo you look like you are the star of a French movie. Thank you for posting even though it is a holiday. Now that we are down to 2 posts a week, each one is precious! But those shoes are tennies—with the athletic soles, you could be walking the dog, yet looking so stylish!! (I know this because I was on the verge of pushing the purchase button on these exact same shoes just 2 days ago). Your first paragraph was worth the price of admission! We are doing the same thing here. Such a lovely dress on you! It’s the wrong silhouette for me, but I so admire it on others. It reminds me of a brown gingham dress that my grandmother wore in the 30s. I keep it in my closet and even though I will never wear it, it makes me happy just having it. 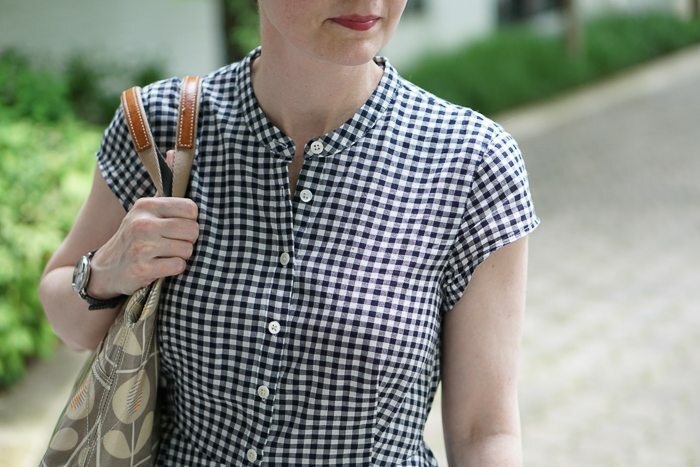 I consider gingham a neutral! I see this dress with your red Coach shoes and a little cardigan. It would become a staple in my closet! I really like the dress, very nice and looks good on you. Not sure about the shoes, if it were me, I would go with flat, scrappy sandals, but that is me. AS soon as summer hits and it sure hits here in Sacramento, out come the sandals! Too hot otherwise to wear closed shoes in what can sometimes be triple degree land. I switched out my Spring clothes – heavy cotton sweaters, long sleeved shirts- for Summer this weekend. It’s fun to have new clothes! It’s weird that they call them court shoes because they aren’t tennis shoe,nor are they court shoes in the British sense,ie pumps to us in the US. I just now got Gingham/Gangnam Style. Just. Now. I strive to maintain cultural relevance.